I’ve spent time making color palettes for myself in the past, mostly they consist of neutrals with a few pop colors thrown in. Ultimately, shopping with these palettes felt very limiting and I would inevitably start to buy fabrics and clothing that was close, but not quite right. That’s why I was excited to find that in this month’s issue of Seamwork there is a fantastic, in depth article on creating a personal color palette by Elizabeth Farr. Elizabeth digs into using technology and free resources to help you design an expansive color palette using your skin tone, hair, and eye color, and then walks you through how you can use in your wardrobe. 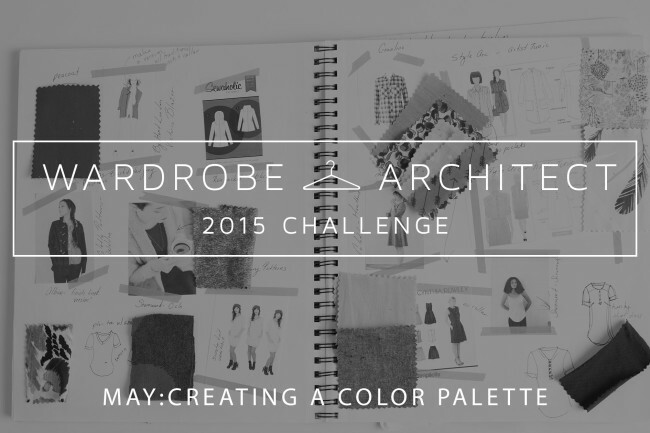 It’s a great resource – and since this month’s theme is creating a color palette and fabric shopping I decided everyone participating in Wardrobe Architect should try out the process for ourselves! First, take pictures in natural light with no makeup. Find the values of your skin, hair, eyes and lips. I used Adobe Photoshop, but Elizabeth has other suggestions for tools you can use. Narrow down your colors to about 25. 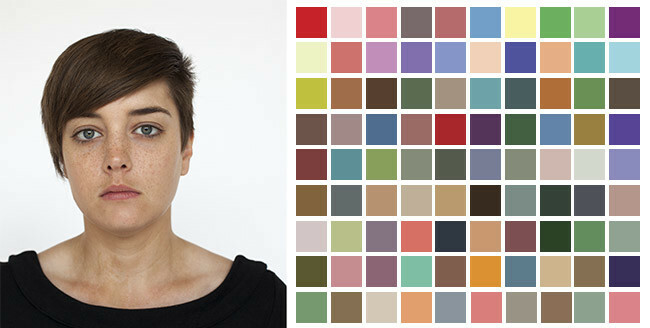 Now use a program such as Adobe Color CC to find the colors that harmonize with your natural coloring. Once you’re finished you can narrow down your color choices by eliminating any that are similar. Write down the RGB values and then find paint chips that match your colors. I used the Easy RGB tool Elizabeth suggested, and then took a trip to the paint store to collect samples. 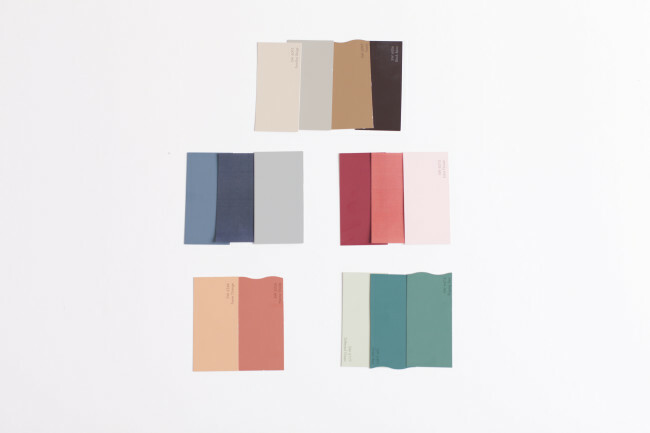 Now take some time to play around with the paint chips and create different palettes. Follow Elizabeth’s guidelines for testing out the colors against your skin. Ultimately, I chose to completely eliminate several colors from my set that while flattering, were not for me. Colors like cornflower blue, pale yellow, eggplant, and baby pink might compliment my skin tone and eye color, but I know I would feel uncomfortable wearing them. You should also take some time to play around with creating seasonal palettes. I love wearing pink in the summer, but steer clear of it completely once the weather cools down, and while I enjoy wearing a lot of deep browns in the fall and winter, it makes my wardrobe feel drab and heavy in the summer. Plus, giving yourself some seasonal variation in your wardrobe means you won’t feel as tempted by new color trends every time the weather changes. Once you’re satisfied with your color palette, it’s time to go fabric shopping! We’re getting ready for summer here, but if you’re in a part of the world where fall is winding down, you will want to shop for winter weight fabrics. Find the list of projects you’ve made for your capsule wardrobe and write down what types of fabric you’re looking for, as well as the general color groups you would like to make it in such as pinks, reds, blues, and white. This will help keep your search organized! Don’t forget to always “shop your stash” before heading out to your favorite fabric store to shop. You may find you already have many of the things you were looking for. 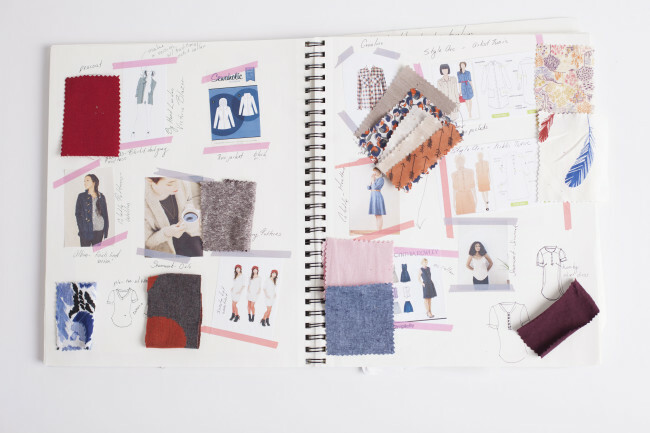 You may be ready to buy yardage for certain projects, or you can just collect swatches to add to your Wardrobe Architect notebook. Once you’ve got your patterns and fabric ready for one or two projects you’re ready to start sewing! Now that you’re ready to sew, what are you planning on buying fabric for first? This just broke my brain. In the best way. Love this! I agree with Ani. It’s very intelligent and beautiful. Thanks for the shout out! I hope my article helps people get to working with their own palettes in their sewing. It’s made a gigantic difference for me in how I feel about my handmade clothes, and I’m always excited to see other people’s palettes in action in their wardrobes! I love your comment about building in some seasonal variety into your colors. I hadn’t thought about that, but I probably do stay away from my darker colors when it’s warm outside. This is good stuff. When I was younger – like 30 yrs- I had my colors done, and have been very happy with that. Well, in the past year I’ve stopped dyeing my hair and now I have silver white hair (at 56) as opposed to the brown shade I’d been wearing for years. Wearing the clothes I have, I’m feeling washed out and invisible. Thinking I should start dyeing my hair again, but everyone says, oh no, it’s just beautiful! Yeah, well they don’t feel washed out!!! :) I’ll definitely be doing this. You probably want to soften your colors up a tad. Your skin will have changed color with age too (this vexes me, at 42 – my skin is definitely not as bright as it was 20 years ago). Instead of high-contrast looks, try wearing your favorites with similar-value colors. Or incorporate scarves that go with your old palette and your new coloring. No sense getting rid of everything – especially everything you love – in one go. Large jewelry can help here too – anything to soften the transition line. My mom (old-school Winter, very high contrast) feels like she looks better in lower contrast colors now that her hair is silver. She also wears the occasional pastel, which she wouldn’t have been seen dead in 30 years ago. The winter colors are still *better*, just worn in different ways (black and white together is a thing of the past). Can you direct me to a site that explains how to get all of the coordinating colors on Adobe Color CC? I’ve been able to find my color values from my hair, skin, etc., but when I go to Adobe CC with the RBG numbers I don’t know how to find other colors. Do you have to purchase Adobe Color CC to be able to do this? I’m like Karen above. I had my colors done many years ago and was a winter. Now at 68 I know those colors should be different. Thanks for all your help and great advice. 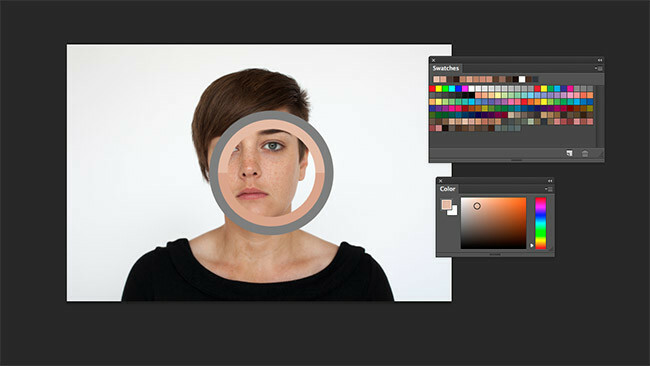 Mary, Adobe Color CC is a free, web based program. When you type in the RGB value in the center box (out of the 5 showing on the screen), coordinating colors and their respective RGB values will pop up in the other 4 boxes. What colors come up depends on what “color rule” you have set. The “color rule” is on the left hand side of the screen as a drop down menu. By the time you’ve gone through all of the options (monochromatic, analogous, triad, complementary, compound, and shades), you should have a pretty complete set of coordinating shades. My article explains a little more how to go about this process. I hope that helps! Absolutely you should have a palette when you sew or work on your wardrobe! I wouldn’t be without mine, although I don’t go about it the same way the author acquires hers. (I roll old-school seasons, with a touch of Zyla). If you keep at it, you’ll be able to reach in your closet and know that everything goes with everything else – at least in color, no insurance about fabric weight or print or whatnot – and that will expand your wardrobe possibilities exponentially. This is SO worth doing. So very much. I’ve never done my colors, so this was fun! I was a bit surprised by the warm browns that appeared, since I don’t have many of those. I’ll think about them when I shop again, though. My project list right now includes layering and seasonal transition pieces since I’m a bit low on those, so I’m sewing a little of every season right now. Fortunately, my stash agrees with my palette. What a relief! I was a teeny bit worried I would need to start over. The pictures next to each of the palettes are different; one is more saturated and high-key than the other, and it’s a pretty drastic difference. Wouldn’t this result in different color choices and complementing color palettes? Our theory is that this is caused by screen resolution. On my computer I can see the differences, but on other computers in the office they look identical. I’ve checked the settings on both images and they are identical, so we’re unsure what else could be causing it! I didn’t go quite so high tech to make my palette. I followed the instructions of the original Wardrobe Architect series and first just made a collection of colors I love (http://meynensoutenboom.blogspot.be/2015/01/wardrobe-architecte-week-5-palette.html), then organized them into neutrals, nearly-neutrals and accent colors (http://meynensoutenboom.blogspot.be/2015/01/wardrobe-architect-week-6-organize-your.html) and finally picked a palette, making sure to balance the three groups (http://meynensoutenboom.blogspot.be/2015/01/wardrobe-architect-week-10-capsule.html). Then I made a project list and a project notebook (http://meynensoutenboom.blogspot.be/2015/02/wardrobe-architect-sketchbook.html). That way I know what fabric I need, and in what amount. Once the fabric has been bought I add a swab to my notebook, so it’s easy to buy notions that go with the fabric. I keep the notebook in my purse for quick reference when shopping fabric or clothes. It really helps to keep me on track. More than once I’ve refrained from buying something, because it doesn’t fit in my capsule. I made a rule for myself to only buy something which doesn’t suit my capsule if it’s love at first sight! When making my palette I realized I always go for accent pieces, whether I’m sewing or buying clothes. So it was a learning experience to buy and sew with neutral fabrics. Often, while sewing I questioned whether I would like and wear a certain item, because it seemed too boring somehow. But I find that the ‘boring’ pieces are easy and fun to combine, and that an outfit with just neutrals or nearly neutrals can be very stylish and fun. Sometimes just adding a scarf or some jewelry can change the whole look and feel of an outfit. I would love to try the approach explained here to make the palette for my winter wardrobe capsule (planning ahead!). Love this, have had my colors done before too and like some of the others somethings have changed now that I am in my 5o’s. I think I can still wear the same colors and through working through this – took me all day tech savvy I am not – to get my color palette. The problem I am having and trying to figure out is how do I take my RGB colors and convert them into colors so that I can go get some paint chips and put them in my wardrobe building notebook? I searched and tried a lot of places and my only solution was to take pictures of the the color sets on my iPhone and then head to Home Depot or Lowes to see if I can find matching paint chips. It would have been much easier if I could have had it done on the computer and then heading out to the stores for the chips but I just could not figure out how to do it. I came late to this whole wardrobe architect and have been working like crazy to catch up which I have done – enjoyed every minute of it and starting to get back into sewing my own clothes so this has been tremendously help, so big thanks for all the work that went into this. Thanks for getting back to me, I actually stumble upon that site the other day and it was a big help. 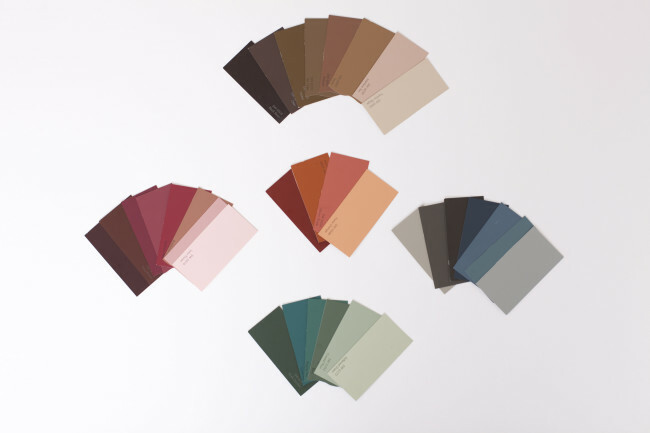 I went to Lowe’s and to some paint chips and books and now have all my colors sorted out so I now I need to go back and get all the chips I need and I will be done with all my color choices.